Starting Monday, May 18 at 7 a.m., until 5p.m. on Wednesday, May 20, Calvine Road from Power Inn Road to Elk Grove Florin Road will be closed to through traffic. This closure has been requested by Union Pacific Railroad for urgent repairs needed for sections of railroad tracks. 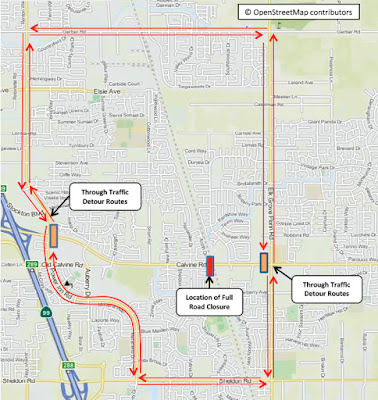 The closure will affect all westbound and eastbound through traffic on Calvine Road -- between Power Inn Road & Elk Grove Florin Road -- including vehicles, pedestrians and bicycles. The full closure of Calvine Road will only occur at the Union Pacific Railroad crossing between Barrymore Drive/Sheldon North Drive to Vintage Park Drive. Access for all property owners and residents will be maintained at all times. Increased Travel Time & Detours: Through traffic is advised to avoid this area during the closure period as there will be significant impacts to all roadway users. Roadway users are advised to use alternative routes until project work is completed (see detour map on back). Detour signs and electronic message boards will be in place to alert motorists, pedestrians and bicyclists about the temporary road closure. Construction Activities: Project work includes Union Pacific Railroad making urgent repairs to sections of railroad tracks. County maintenance crews will also repair adjacent sections of pavement on Calvine Road on the east and west sides of the railroad tracks. 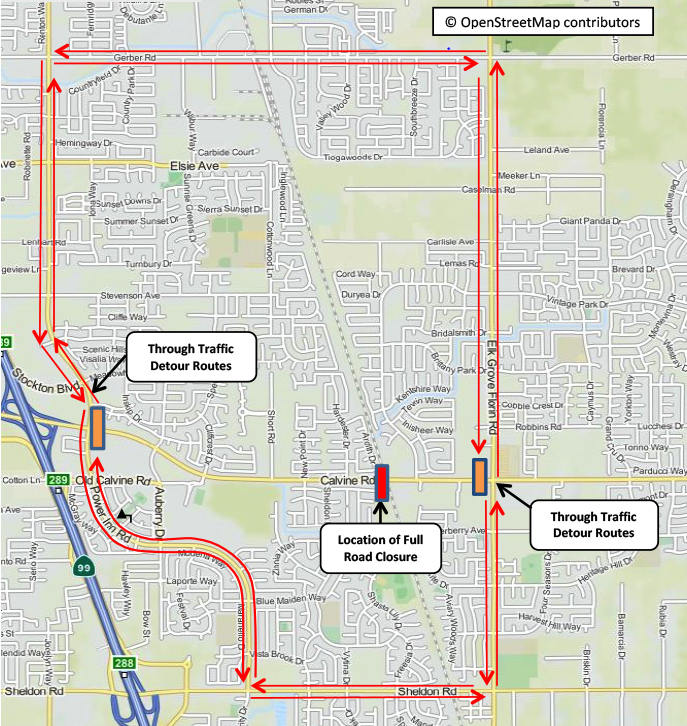 Closure Period: Sacramento County and the City of Elk Grove understand the challenges and inconvenience that commuters, residents, businesses, bicyclists and pedestrians will experience during the closure period and ask for the public’s patience and cooperation as we work to complete this project.